Between 1805 and 1858, treaties made between the U.S. government and the Dakota nation reduced Dakota lands and significantly altered Minnesota's physical, cultural, and political landscape. These treaties had serious implications for the future of Dakota-U.S. government relations. It is probable that many Dakota left treaty negotiations feeling cheated because often large portions of the annuity money promised to the Dakota in exchange for land went immediately to traders who made claims of debts owed by the Dakota. By 1862 delayed annuity payments from the U.S. government, coupled with crop failures and the refusal by traders and Indian agents to extend credit to the Dakota, left many Dakota people hungry and desperate. On Aug. 18, 1862 a group of Dakota soldiers began attacking trading posts and settlements along the Minnesota River Valley, and the U.S.-Dakota War of 1862 began. Soon after the fighting began, Sibley was appointed colonel by Minnesota Governor Alexander Ramsey and given command of the state’s military response. On Aug. 20, 1862, Col. Sibley and the 6th Minnesota Infantry, a hastily-formed regiment of local volunteers and army troops, marched from Fort Snelling towards the town of St. Peter. After waiting several days for supplies and reinforcements, Sibley and his forces advanced towards Fort Ridgely with approximately 1,400 soldiers, arriving on Aug. 28. After reinforcing Fort Ridgely, Sibley focused on training the troops for further battles with the Dakota. While at the fort, Sibley sent out a burial party to locate and bury the remains of civilians. The burial party was attacked by Dakota soldiers at Birch Coulee on Sept. 2, 1862. When reports of the attack arrived at Fort Ridgely, Sibley immediately left for the fighting with the remainder of his force, which by that time included two companies of the 7th Minnesota Infantry. After the Dakota withdrew from the battle, Sibley and his troops returned to Fort Ridgely to continue their training. Battle of Birch Coulee, Dorothea Paul, 1975. In early Sept., Sibley tried to negotiate a settlement with Taoyateduta, but Taoyateduta did not agree to stop the fighting. He explains the reasons for the war and states that he is willing to release prisoners. Sibley demanded surrender, but Taoyateduta refused. Under considerable political pressure to defeat the Dakota quickly, Sibley and his troops moved up the Minnesota River, arriving at Lone Tree Lake (mistakenly identified as Wood Lake) where they camped on the night of Sept. 22. The next morning several soldiers from the newly arrived 3rd Minnesota Infantry left camp to forage for food and stumbled upon a group of Dakota soldiers who had been preparing to attack Sibley’s forces. The ensuing Battle of Wood Lake on Sept. 23, 1862 was the last major battle of the U.S.-Dakota War of 1862, resulting in a decisive defeat for the Dakota. 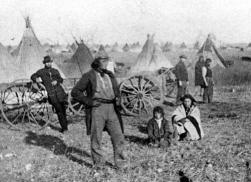 After the Battle of Wood Lake, many of the Dakota who participated in the war fled Minnesota. Of those who remained, approximately 2,000 (of who roughly 1,600 were non-combatants) surrendered to Sibley’s military force on Sept. 26 at Camp Release, near present-day Montevideo. With these Dakota people were more than 250 European-American and “mixed-blood” (people of both Dakota and European ancestry) prisoners who had been captured by the Dakota soldiers during the war. Sibley established a Military Commission and 392 Dakota men were tried for killing and assaulting civilians. By the end of the process, a total of 307 men were sentenced to death, but Sibley reduced the initial number to 303 after reviewing the testimonies. The execution orders needed to be approved by the President of the United States before they could be carried out. Upon further review of the evidence, the number of condemned men was further reduced to 39 by President Lincoln, who sought to distinguish between Dakota soldiers who had participated in battles with U.S. soldiers and those accused of killing and assaulting civilians. At the last minute a Dakota man named Tatemina (Round Wind) was also reprieved. The remaining 38 men were hanged in Mankato on Dec. 26, 1862 in the largest mass execution in U.S. history. During the summer of 1863, newly-promoted Brig. Gen. Sibley and Brig. 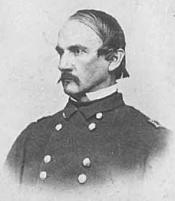 Gen. Alfred Sully mounted a joint military operation called the “Punitive Expedition” against those Dakota who left Minnesota and headed into the western territories. Sibley’s troops pushed past Devil’s Lake towards the Missouri River, fighting three major battles against combined Dakota and Lakota forces: Big Mound (July 24) Dead Buffalo Lake (July 26); and Stony Lake (July 28). By the end of August Sibley had returned to Minnesota, while the Sully expedition continued on and engaged an encampment of Yanktonai, Santee, and Teton (Lakota) at Whitestone Hill (Sept. 3-5). In 1864 Sibley remained in Minnesota while a second military expedition was launched. Sully held overall command and defeated a large combined group of Dakota, Lakota and Yanktonai at the Battle of Tahchakuty, or Killdeer Mountain (July 28). For his military service Sibley was promoted to Major General of Volunteers in 1865. Eventually, the U.S. military forcibly removed many Dakota to reservations in North and South Dakota. Intermittent fighting continued in the western territories throughout 1800s, culminating at Wounded Knee on Dec. 29, 1890. Carley, Kenneth. The Dakota War of 1862: Minnesota’s Other Civil War. St. Paul: Minnesota Historical Society Press, 1976. Clodfelter, Michael. 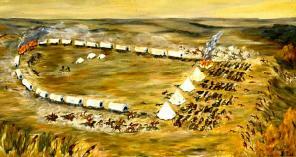 The Dakota War: The U.S. Army Versus the Sioux, 1862-65. Jefferson, NC: McFarland & Co., 1998. Lass, William E. Minnesota: A History. 2nd ed. New York: W.W. Norton & Company, 1998.